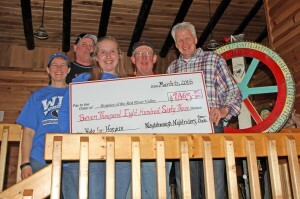 The Naytahwaush Nightriders Sno-Club recently announced that this year’s Ride for Hospice, held in February, raised $7,863 for Hospice of the Red River Valley. In 12 years of the ride, the Nightriders have raised $82,615 to help provide hospice care to patients and families in Naytahwaush and surrounding areas. The Nightriders presented a check to Curt Seter, development officer for Hospice of the Red River Valley, at their annual Snodeo held March 5-6.